A few weeks ago, while sitting on an exercise ball, attempting to strengthen his core, I asked “Rabbi Joe” Mendelsohn, of Temple Israel in Scranton, if would like to participate in this column by sharing some reflections for the New Year. According to American Association of Retired Persons (AARP), seniors are considered those 50 years old and older. I will never forget how humbled I felt when I received my application to join AARP two years ago. With this in mind, this year I offer healthy holiday resolution for seniors. One topic that is constantly resurfacing for physical therapists is osteoporosis. This week’s column will review the definition, cause and prevention. 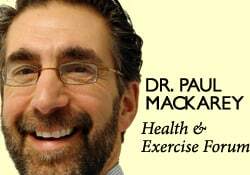 Next week, I will present the 10 best exercises to prevent osteoporosis. Spend Time Outdoors–It’s Good For You! It is reported that Americans spend 90% of their lives indoors and that number increases with age. The truth of the matter is the risk of being one with nature is far less than the ill effects of a life stuck indoors. Please consider the following benefits of spending time outdoors. Because of the possibility of the life-threatening, and at best life-altering, consequences of dehydration, prevention is best defense against dehydration. Consider some of the following practical tips to promote optimal hydration. Summer heat is here and the risk of dehydration continues for one specific group, the elderly. Age, diet, illness and medications are some of the many reasons why elders suffer from dehydration not only in the summer heat, but year round. Maintaining Mobility Just Got Easier! Walking is essential for our physical and emotional well-being, preventing blood clots, pneumonia and depression. Now, thanks to new technology, a computerized walking assistance device may be the answer for many who are too weak to walk and climb stairs independently, yet too strong and determined not to try. The ability of the blood to clot to close and heal a wound is something most of us take for granted. However, when this system is not working properly, serious health problems occur. Fortunately, it is treatable and preventable in most cases. This week will be dedicated to the definition and cause of blood clots. On a very frequent basis, parents of young athletes ask when it is safe for their children to participate in weight training. Amen for 2010! Begin a Healthy Lifestyle! Physical activity is one of the most important factors in improving a lifestyle in a positive way. A minimum of 30 minutes of physical activity, 5 days per week can greatly contribute to longevity. Make 2010 your year to adopt a healthy lifestyle! Stay Limber and Stay Healthy! This column will address a question that is frequently asked by people of all ages and activity levels…stretching. October is National Physical Therapy Month: Keep on Moving! In honor of physical therapy month, I would like to share a story about a friend of mine who has multiple sclerosis (MS). Last year an article in Skeletal Radiology received significant attention for disproving “current wisdom” about running and knee arthritis. Researchers from Austria used MRI imaging to examine the knees of participants before the 1997 Vienna Marathon. Ten years later, runners received an MRI before the 2007 race. Scans of those participating in both races were compared for changes. The results were very surprising. Last week I attempted to answer an email from Don Loftus, a teacher a Scranton Prep and former athlete who suffers from arthritis in his knees. This week will discuss the treatment options available to former athletes and others for the management of knee arthritis. All joints suffer from wear and tear over time. Weight-bearing joints such as the hip, knee and ankle, tend to wear out faster than others. Moreover, trauma, from sports, overuse, occupation, or accidents, will expedite this process. This form of arthritis is called, osteoarthritis. Total ankle replacement (TAR) is recommended for severe ankle pain which has not responded to conservative treatment: weight loss, activity modification, physical therapy, and anti-inflammatory medication and cortisone injections. I have been advising my patients to exercise, keep active, and walk as long as they can in order to stay mobile and healthy. However, seniors often tell me activities that require prolonged walking is limited by ankle pain from arthritis. They often ask, “What is arthritis of the ankle?” How does it happen? What can I do about it? Patrick McKenna, Editor for The Times-Tribune recently sent me copy of a press release regarding a warning from the Centers for Disease Control and Prevention (CDC) that the prevalence of arthritis will increase significantly by 2030. Most doctors recommend some form of exercise with arthritis. Pain and fatigue are the most limiting factors for the person with arthritis. Pool exercise may be the answer.